The deserts of the world today are not the deserts of the planet's past. Fossilized hippopotamus and elephant bones tell us that the Sahara, for instance, was a much moister and more hospitable environment 8,000 years ago than it is now. Each of the Earth's modern deserts are a consequence of one of the following mechanisms: air mass subsidence, rain shadows, distant moisture sources, or cold offshore temperatures at the sea's surface. 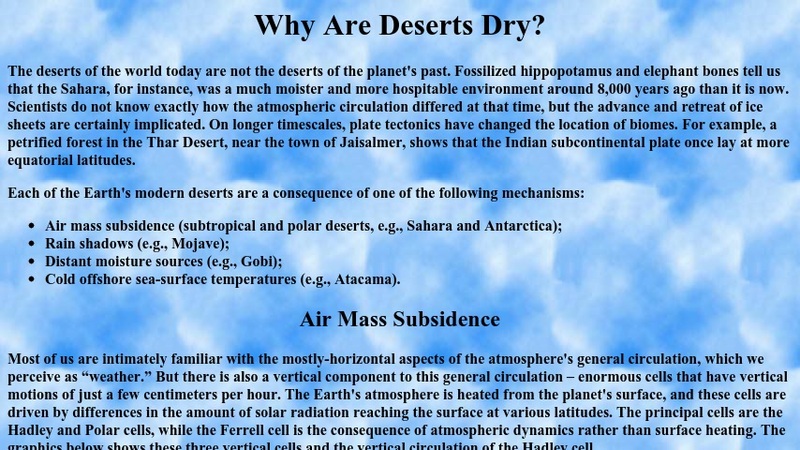 This site uses text and scientific illustrations to describe how each of these mechanisms results in the occurrence of deserts.